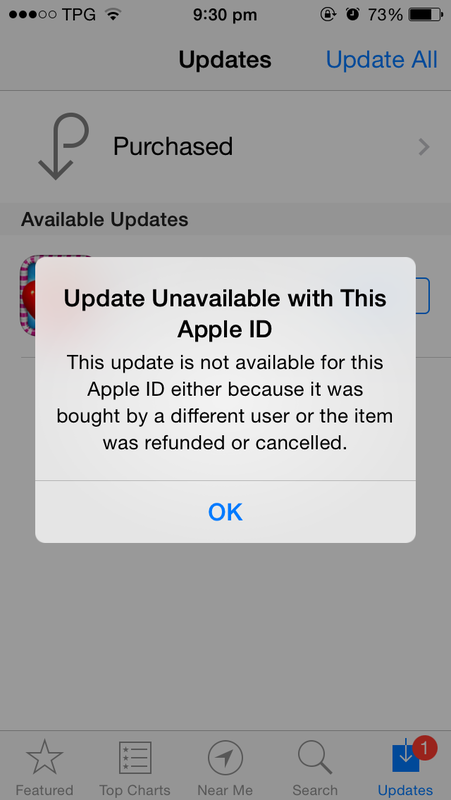 "Update Unavailable with this Apple ID - This update is not available for this Apple ID either because it was bought by a different user or the item was refunded or cancelled." Sign out and Sign in of the the App Store through the phone's settings. Change password and sign in again. Delete and reinstall the causing the problem. My iPhone (5S) was bought new and I have never had any other Apple ID on this phone other than the one that I've always been using. I have used the same Apple ID in multiple countries but have never faced any problems. Frustrated, I searched the internet and the Apple forums suggested that it was not just me who was facing this problem, others were also in the same boat, however, this problem was only limited to a few users. I was convinced that the issue was not at my end and it was Apple's servers that were acting funny. Unsatisfied, I kept trying the update button roughly every two hours but the issue persisted. Before going to sleep, I tried to update once again but it still wasn't ready to authorise my Apple ID. However, when I tried updating the Apps in the morning, it updated just the way it should. Thus, the only solution is to be rest assured that the problem is not at your end and Apple is most likely to resolve it. Top Tip: have patience, it will get resolved on its own.